``Shawkl``: Check Out My New Artwork! Check Out My New Artwork! I'm playing around a little with PicMonkey...which I'm loving the choice of borders and shapes!. AND, the fact that it is so easy to create a cool picture object. The site is tons easier for my ole brain to understand than PhotoShop editing software is! Yeah, I know...I hear all of you Photoshop Users...I know...PicMonkey is NOT as powerful as PhotoShop. Not by a long shot for sure...But, I don't need a load of power...and complicated photo editing. I'm perfectly happy with mediocre photos...as long as they are cropped and in focus...hey, I'm content! What else can I say. But, I'm loving what PicMonkey has to offer in the way of adding borders, frames, and extras! And, I love easy ways to add interest to my blog...don't you? I can see all kinds of opportunities to create art for the blog with the PicMonkey site. And, one of the best things?....You can use it for FREE! Okay, you can sign up for an "upgrade" and not get those annoying pop-up advertising thingies..."which I did sign up for"....cause it's frankly worth the $4.95 per month to not be annoyed!! And, I get some shout-outs from them about new things added to their site. But...you...don't HAVE to register to use the site. You can just use it as a "visitor" every time you need too...for free! Just click on Create Collage to get started on the site. Seriously...this site is SOOOOOooooooo worth you checking out.....and don't forget to add the PIC-MONKEY site link to your bookmarks so you can find it again, after today...hey, I'm just saying! And, another shout out...for the BlogGuidebook for reminding me about PicMonkey and all of their great features. I had used the site before...but, then forgot about it. I know, I know...yep, we all know that I'm loosing it! No since in you reminding me...so please don't send me mail about my horrible memory! Hugs! But, thanks to Sarah at the Blog Guidebook...which is a nifty blog ...worth following as well! 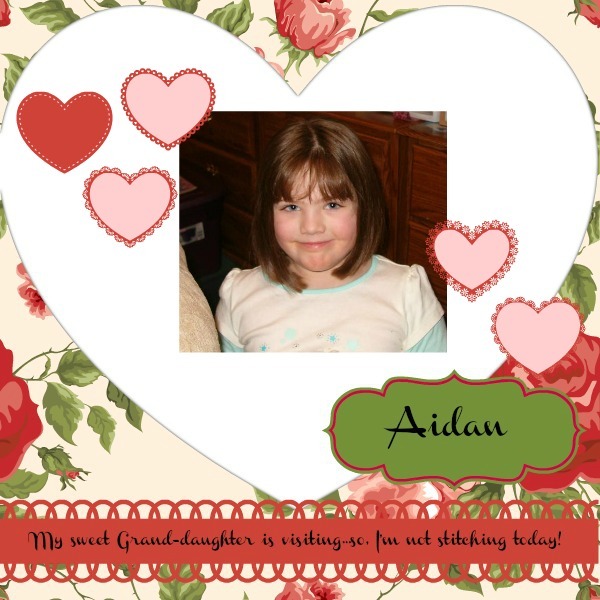 BTW, Aidan really is visiting...and I'm really not stitching today! Hugs! !